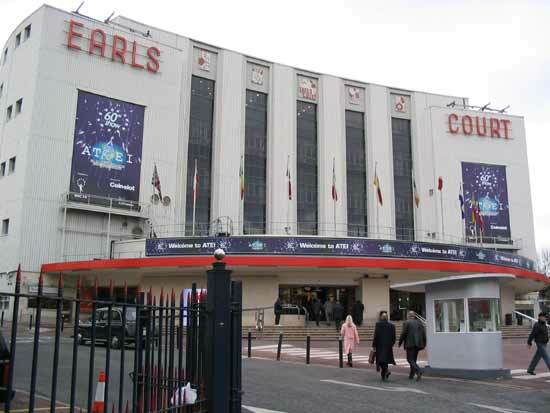 A crisp and cold Wednesday morning in central London and the 60th annual amusement trade show ATEI is back in the Earls Court exhibition centre. This was an unusual show for pinball fans as it was the first for several years without the launch of a new Stern pinball game. Lord Of The Rings had first arrived in the country in November last year, so many people had seen it and played it by the time of the ATEI show. But that didn't stop plenty of players lining up to play the game at the Electrocoin stand. 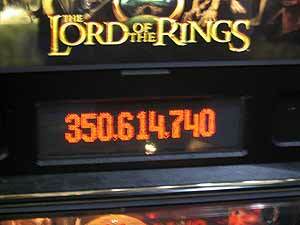 There were four Lord of the Rings game on the stand, one of which was fitted with the ToPS tournament system. While all the games had the UK All-Skill posts fitted, some games had them enabled while others did not. Gary Stern was present to talk business and promote the game by appearing in photographs and signing flyers. We have covered the game extensively in our game review so I'll add no more than to brag that I had my best game ever at the show on a machine without the extra posts and a non-registering Balrog; a game that lasted over an hour, collected all six gifts, played all the modes, played "there and back again" and even had to stop and hold the ball while a photo shoot took place before continuing. And the first ball only scored 200,000. 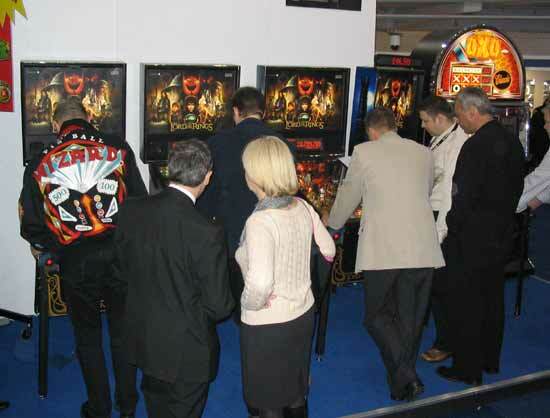 There were no other genuine pinball games at the show just like last year, and like last year TAB were present and promoting their Virtual Pinball game. 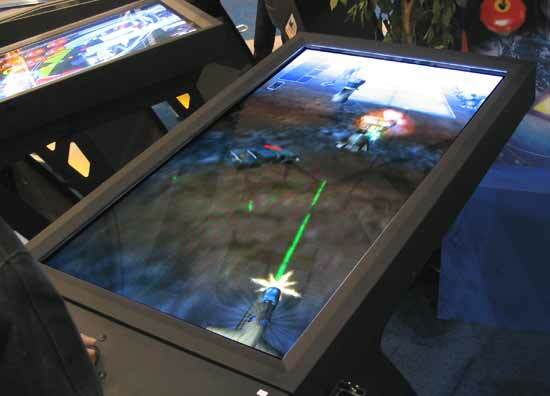 They had a special arrangement of ten games in a circle to show off the modifications they have made to the plasma screen video pinball. The basic game - Popstar - is largely unchanged from previous versions but it now has a trackerball on the top surface. This is occasionally activated during the game and you can use it to control the ball in a Marble-Madness style. TAB's big promotion was to advertise the addition of two extra games for the Virtual Pinball platform. However, this fell rather flat when it turned out that the second game "Pirates of the Sea" was only a demo while the third, "Air Commander" was a second-rate shoot-em-up and not pinball at all. TAB seem unsure what to do with this hardware. The basic Popstar game isn't good enough by itself, but rather than improve it, they bring out more of the same. The same choice was faced the Pro Pinball team and they opted to improve the basic ball physics before producing more games. 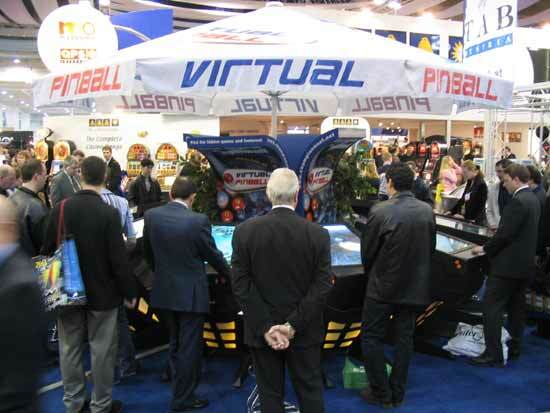 TAB should do the same because while Pro Pinball was at the cutting edge of pinball simulation, Virtual Pinball is still over ten years behind. Now, having said all that, I spent fifteen minutes playing Popstar and found it mildly entertaining but frustrating when software bugs caused the left flipper to freeze or the ball to suddenly achieve supersonic speed, or for it to jump the flippers. One final item of interest for pinball fans was found in the adjacent hall. ICE, the International Casino Exhibition usually has little pinball related but as I passed by I saw the large stand by IGT and remembered something from one of the talks at Pinball Expo. Sure enough, standing by the Multi-Strike Poker games was Larry DeMar. Larry was happy to talk about both gaming and pinball. 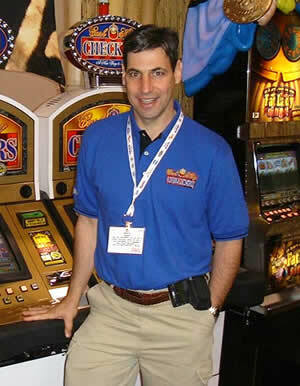 His company LED Gaming is four years old and had great success with the video poker format they developed for IGT, employing former Williams employees Duncan Brown and Scott Slomiany. But the biggest surprise of the day was reserved for the end and was outside the show. Visitors leaving the exhibition found the crisp bright day had turned around and it was now snowing heavily.